"Out of darkness, these blades will light our way." The Special Operations Sangheili is a Covenant Sangheili rank. It is the lowest rank in the Special Operations branch, superseded by a Special Operations Officer Sangheili. Special Operations Sangheili are members of the Special Operations branch of the Special Warfare Group. Sangheili of this rank are extremely skilled warriors and are sent in to accomplish some of the most dangerous and difficult missions. Special Operations Sangheili were widely utilized by the Covenant during its genocidal campaign against the human race. Towards the end of the Battle of Meridian, a team of Special Operations Sangheili and a Kig-Yar soldier deployed to the surface of the planet using a Covenant drop pod. The team deployed a Kindler and are able to find a Luminary, which they proceeded to deliver to the Prophet of Regret. The Luminary would later reveal the locations of the Halo rings, the Ark, and a slipspace portal to the Ark found on Earth. During the pre-invasion of the human colony world of Reach, the Fleet of Valiant Prudence discreetly deployed a team of Sangheili Zealots to disable one of the planet's communication outposts at Visegrád. When the SPARTAN-III NOBLE Team was sent to investigate the communications blackout, they found the entrance locked, with the mechanism flash-fused. While Kat-B320 attempted to unseal the doorway, the rest of NOBLE defended her from waves of Covenant attackers. A team of Special Operations Sangheili, along with a Sangheili General was dropped off as one of the final groups of attackers. A squadrom of Special Operations Sangheili were deployed via Phantom onto the third flood of ONI SWORD Base by way of the breached exterior wall. These forces were defeated by the combined efforts of SPARTAN-B312 and Emile-A239. Several were also sent in along with a Mgalekgolo pair to stop the sabotage of one of the Covenant stealth pylons by Jun-A266 and SPARTAN-B312. These pylons that was being used to conceal large scale Covenant troop deployments in the Viery Territory on the eve of the invasion of Reach. The Covenant forces were unsuccessful in stopping the Spartans. The bridge of the SDV-class heavy corvette Ardent Prayer was crewed mainly by Special Operations Sangheili under the command of Shipmaster Ardo 'Moretumee. During Operation: UPPERCUT, the ship was boarded by a team of YSS-1000 Sabre pilots lead by SPARTAN-B312 and Jorge-052. The strike team eventually entered the bridge, catching the crew unaware. While 'Moretumee and his Special Operations Sangheili defended themselves, they were ultimately killed by the boarders, allowing the humans to carry out their mission, resulting in the destruction of both Ardent Prayer and the CSO-class supercarrier Long Night of Solace. In the later stages of the Fall of Reach, the Covenant began to glass large areas of the planet. ONI SWORD Base was one of the primary locations to be hit. Much of the base was reduced to rubble and many of the outlying areas were flooded due to the melting ice floes nearby. A team of Special Operations Sangheili was dispatched into the base along with a Sangheili General and a Huragok. They were in the process of scouring the ruined atrium when they were attacked by NOBLE Team. Ultimately the Spartans were able to neutralise all Covenant forces in the room. During the Battle of Installation 04, a squadron of thirty Special Operations Sangheili were deployed into the human-controlled Alpha Base using a captured UNSC dropship. Their objective was to cause chaos among the human ranks so as to allow six Spirits containing more Covenant forces to land. Many of them were killed when the landing pad that the Pelican had touched down on was flooded with fuel and set alight. The survivors made it into the lower levels of the base where they killed every human they found, including those in the Control Room. Eventually all Special Operations Sangheili were killed by a fireteam of Marines, with only Special Operations Officer Zuka 'Zamamee and his Unggoy assistant Yayap escaping. Later in the battle, the Flood parasite managed to escape containment and soon spread across the surface of the installation. At least one Covenant Spirit was captured by the Flood. They used the dropship to board the agricultural support ship Infinite Succor unbeknownst to the rest of the fleet. When the ship lost communication with the rest of the fleet, Supreme Commander Thel 'Vadamee assembled a team of Special Operations Sangheili and Unggoy lead by Commander Rtas 'Vadumee to retake the ship from what was assumed to be human forces at that point. During the events aboard the Infinite Succor, all members of the Special Operations team were killed or infected by the Flood, leaving 'Vadumee as the sole survivor. The Flood were able to overwhelm the cruiser Truth and Reconciliation which had been holding position near the surface of the installation. A strike team consisting of Special Operations Sangheili and Unggoy were sent in to neutralize the Flood and prepare the ship for immediate departure. Over the course of the battle, many Spirit dropships and Banshees were seen deploying Special Operations forces into the cruiser by SPARTAN John-117. By the time the remaining human forces on the ring stormed the Truth and Reconciliation, the strike team and the Flood had managed to nearly wipe each other out. Towards the close of the battle, a contingent of Special Operations forces consisting of Sangheili and Unggoy were present on board the crashed Pillar of Autumn, where they battled against the Flood as well as Sentinel forces. After the conclusion of the Battle of Installation 04, the Spartan-II Master Chief lead a group of survivors from the battle in a boarding effort against the Ascendant Justice, the flagship of the local Covenant fleet. During his assault on the bridge, the Master Chief fought against a single Special Operations Sangheili. The Covenant warrior was nearly able to kill the Spartan, but the human was able to get the upper hand with the help of his compatriots and the Sangheili was grievously wounded and knocked into an escape pod, which the Chief proceeded to fire away from the ship. The fate of this Sangheili is unknown. Shortly after the Battle of Installation 04, the Prophets sent a team of Special Operations Sangheili lead by Rtas 'Vadumee to assist the newly adorned Arbiter Thel 'Vadamee in his mission to kill Sesa 'Refumee and the heretic forces under his command. Despite the unexpected entrance of the Flood into the battle, the team were ultimately successful in completing their mission. During the Battle of Installation 05, many Special Operations Sangheili were deployed into the Quarantine Zone via drop pods and Phantom dropships along with vehicular support in order to assist the Arbiter in acquiring the Sacred Icon necessary for the Covenant to complete their 'Great Journey'. Later in the battle, when the Hierarchs denounced the Sangheili, casting them out of the Covenant, many Special Operations Sangheili along with the rest of their species fought against the now Jiralhanae-led Covenant forces on High Charity. Many more Special Operations Sangheili aided Thel 'Vadam in his push through several Jiralhanae-occupied structures. A number of Special Operations Sangheili assisted Thel and Sergeant Johnson in killing the Chieftain of the Jiralhanae Tartarus. While many fell to the Chieftains gravity hammer, they were successful in stopping him from activating the installation. Towards the end of the Battle of Earth, the Fleet of Retribution entered the area above the city of Voi, in pursuit of the Flood-infested cruiser Indulgence of Conviction. The ship had managed to break through the Sangheili's quarantine of Installation 05 and ultimately crash-landed in Voi, allowing the Flood to spread onto Earth. The fleet deployed Special Operations Sangheili to assist John-117 and Thel 'Vadam in destroying the source of the Flood infestation, as well as to locate something in the remains of the cruiser. Description: "Out of darkness, these blades will light our way." In Halo: Combat Evolved, Special Operations Sangheili are clad in black, but wear purple/steel armor in Halo 2 and Halo 3. They are similar to Stealth Sangheili, as they both possess active camouflage technology. 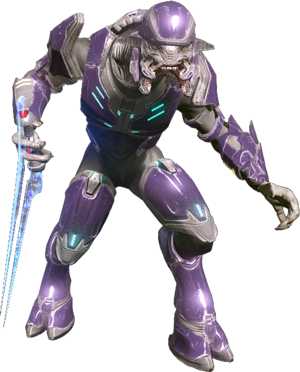 However, the two are different and should not be confused: Stealth Sangheili have gray/brown armor that has little or no shielding, and they are permanently cloaked until they are killed, whereas Special Operations Sangheili have purple/black armor that is shielded, but their active camouflage only remains active if the user does not fire or get hit by enemy fire. In Halo: Reach, they are depicted wearing a dark red Infiltration harness. A Special Operations Sangheili in Halo: Combat Evolved. A Special Operations Sangheili with his Type-25 plasma rifle aboard the Truth and Reconciliation in Halo: Combat Evolved. A Special Operations Sangheili wielding an energy sword in Halo 2. A Spec Ops Sangeili in Halo 2. A Special Operations Sangheili with a particle beam rifle in Halo 2. A squad of Special Operations Sangheili in a Type-52 Phantom. A Special Operations Sangheili with an Assault Harness in the Battle of Voi in Halo 3. A Special Operations Sangheili in Halo 3. A trio of Special Operations Sangheili in Halo 3. Concept of the Special Operations Sangheili from the Silent Shadow wearing a heavily modified Infiltration harness in Headhunters. Concept art of a Special Operations Sangheili for Halo: Reach. Another concept art of a Special Operations Sangheili for Halo: Reach. A Special Operations Sangheili jumping in an attack. Special Operations Sangheili in Halo: Combat Evolved Anniversary. A Special Operations Sangheili in Halo 2: Anniversary. A Special Operations Sangheili giving orders in Halo 2: Anniversary. A Special Operations Sangheili with a Kig-Yar Sniper. A Special Operations Sangheili abusing an Unggoy. A Special Operations Sangheili with a particle beam rifle in Halo 2: Anniversary. Two Special Operations Sangheili on the Threshold gas mine. A Special Operations Sangheili dual wielding plasma rifles. A Special Operations Sangheili on Installation 05. A Special Operations Sangheili and a Sangheili Zealot on Installation 05. A Special Operations Sangheili, as they appear in Warzone. The same model and colour is used for almost all Sangheili bosses.